It feels like I took forever to read this book. I started in July last year, yet I kept putting it off because I had to finish reading final parts of series that I didn't want spoiled on tumblr or any other site. I believe this book is a treasure for any age. It's good for children, teens, young adults and adults because even if you read it to your child as a bedtime story, you can still become immersed in Bod's world and life in the graveyard. I think this is a great companion for children who are a little scared of the dark because it makes the macabre seem less frightening (if you are the type of person who becomes friends with characters like me). I must admit I was a bit confused during the beginning because the chapters seemed a bit episodic and I couldn't join the dots till almost halfway through the book, but that doesn't make it less enjoyable in my opinion. 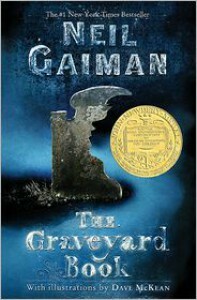 I also recommend alternating with the audible version, I think having Neil Gaiman himself narrate the book is a treasure in itself and makes the book even more interesting. I don't want to say a lot more about it because I'm afraid if I start delving into all of the reasons I enjoyed it, I'll give potential readers spoilers and I like to keep my reviews spoiler free.